NOW: Jean Sherrard made a slight adjustment for his “repeat” of Zallinger’s art to better show the musical accompaniment to the Museum of History and Industry’s “last day” party last June 6, which was also the 123rd anniversary of Seattle’s Great Fire. MOHAI will open again later this year at its new Museum in its new old home - the reconfigured armory at the south end of Lake Union. Imagine asking the famous – and stuffed – gorilla named Bobo what were the two most popular artifacts on show at what since early June of this year has been the old Museum of History and Industry in Montlake. Bobo – being a modest gorilla who thru many years kept a steady eye on the museum’s exhibits from his own glass case – would, I think, choose the “Founding of Seattle” diorama with its puppet pioneers and the Great Seattle Fire mural. I would agree with the western lowland primate. 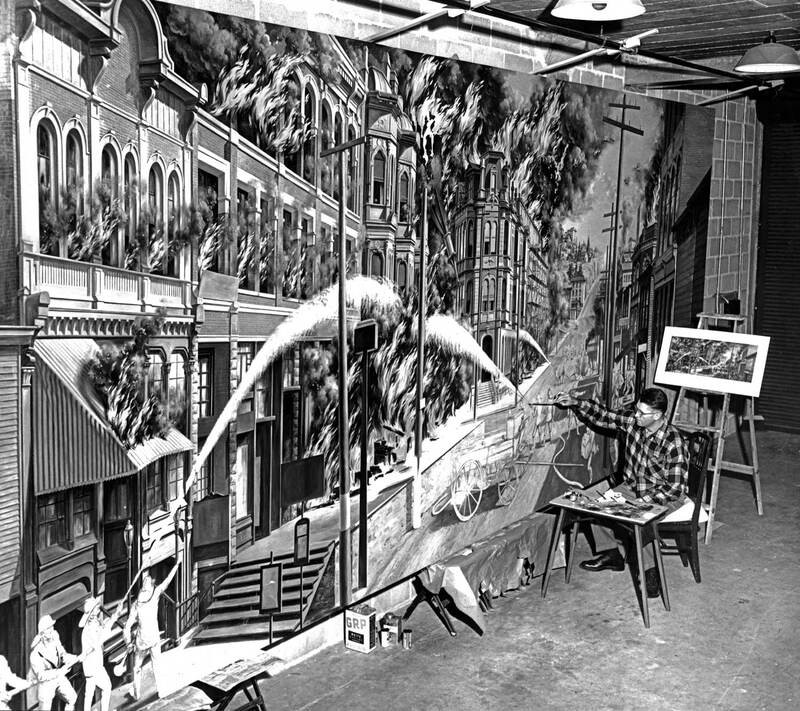 The mural is shown here with its artist, Ruddy Zallinger, in a press photo that was first published in this newspaper on Dec. 5, 1952. 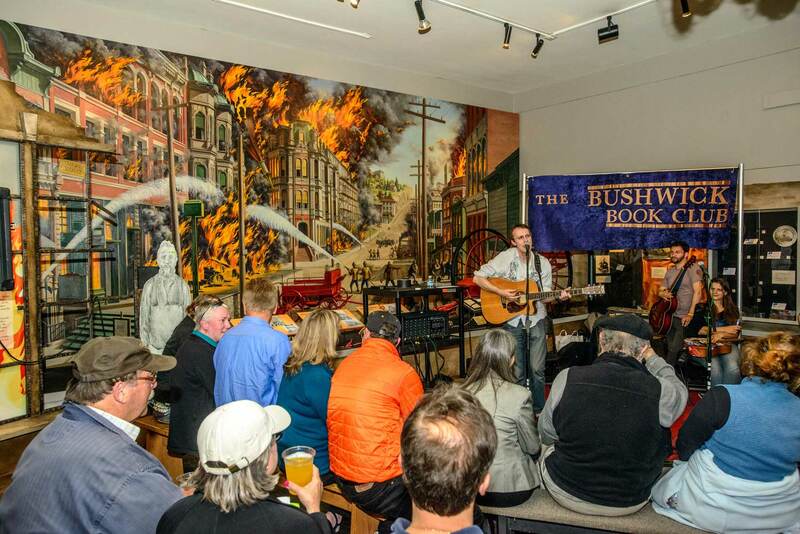 The then 34-year old Zallinger explained that he’d been working on the 10-by-24-foot mural for four months and hoped to complete it by Christmas. For rendering the pioneer buildings the “scientific muralist” studied old photographs kept by the Seattle Historical Society. For the flames he studied fires nearby at the Montlake landfill. Raised in Seattle and taught at Cornish School, Zallinger was still fresh from winning a 1949 Pulitzer Prize for a much larger mural “The Age of Reptiles” that took five years to complete for the Peabody Museum of Natural History on the Yale University Campus, where Zalinger was also an instructor. 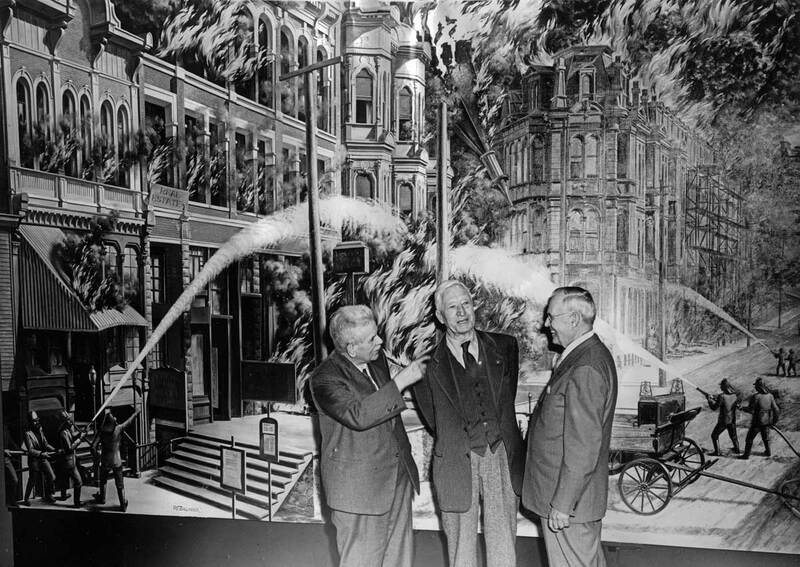 Zallinger’s Great Seattle Fire mural was dedicated on Feb. 15, 1953, the first anniversary of the museum’s opening. A band playing “There’ll be a hot time in the old town tonight” accompanied the unveiling. Those attending included at least fifty persons who were surviving eye-witnesses of the Great Fire of June 6, 1889, and some of their stories were told in a recorded program that followed the unveiling. For the occasion of the mural’s 50th anniversary rededication on Feb. 15, 2003, there were, of course, no first hand witnesses attending. Bobo, however, was there. The Denny Party on Alki Beach diorama and the other "most popular" depiction of Seattle history at MOHAI. Sure Jean, a few features that relate and a few corrections for, I think, two of those. (Perhaps just one.) 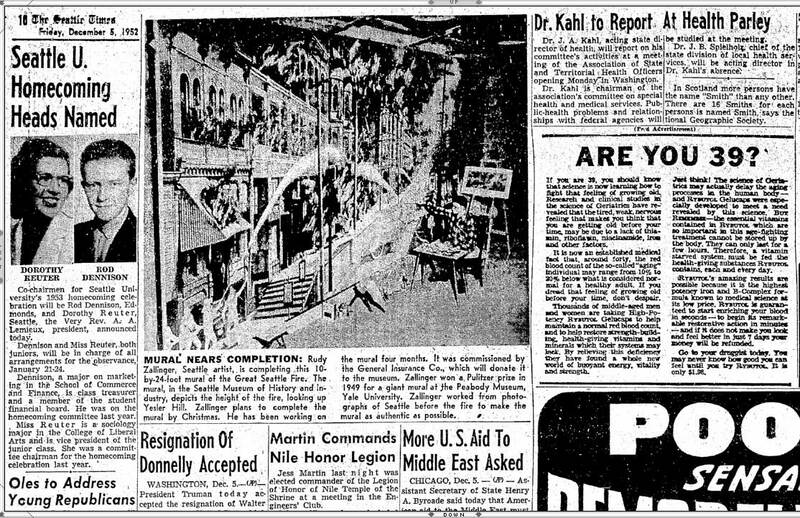 The featured historical photo at the top, as the story goes, was printed in the Times in 1952. I “grabbed” that off the Seattle Public Library’s link to the complete Times from 1900 to 1984/5. On the right side, you may note that the reader is asked “Are you 39?” Most likely, quite a few of them were. Those among them who are still among us would now be 99. How old were you in 1952? I was 14, and have now 60 years later, really no sense about what it was like to be so much a young teen. Except that certainly, my bike – a spitfire with Balloon tires – was most important, and during the summer the swimming pool at Spokane’s Comstock Park was an addiction. There was at 14 not requirement yet to look for summer work. On the left and gesturing is George Cotterill historically one of Seattle's most effective citizens - as engineer, mayor, state senator, author, and Port of Seattle Commissioner. He lived long. As a young engineer-surveyor he helped plot the route for the Seattle Lake Shore and Eastern Railway along the north shore of Lake Union in 1886-87. Here he is fit and performing for the camera and those with him 65 years later. He surely remembered the Great Fire - and probably wrote about it. The first mistake is another one of negligence; that is, after a lot of searching I could not find the negative for the “then” used in the April 12, 1998 Pacific feature, and printed, as a substitute, in facsimile directly below. We will spill the text alone at its footstep (below it) and then include two scenes from the MOHAI front porch, a place that was somewhat near to the historical photographers prospect. 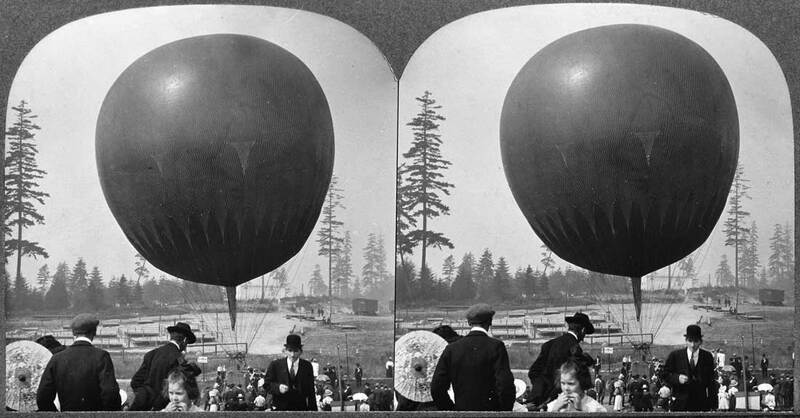 Following that we will enter the 1909 panorama of Union Bay thru to Wallingford taken from the AYP’s captive balloon, and we will also show the balloon. This first appeared - like this - in the Pacific Mag. for April 12, 1998. A repeat of the text follows below. The scale of this picturesque lake scene can be figured just left of its center. 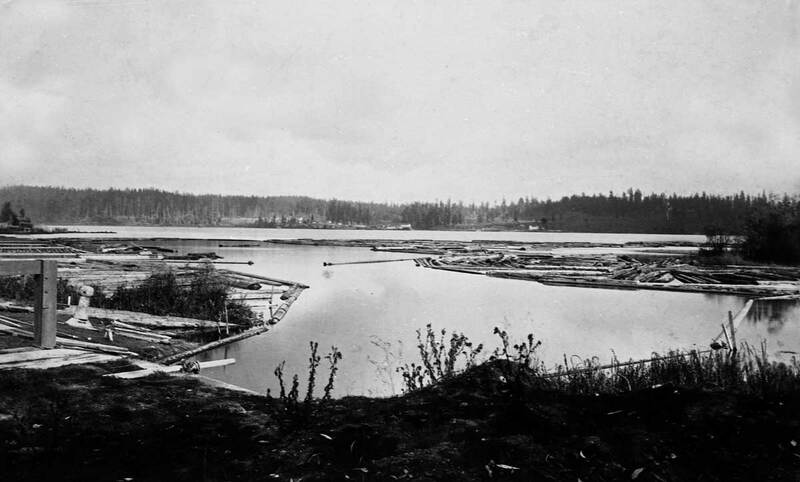 There, riding a flat-topped scow, two Lilliputian lumberjacks are at work corralling logs into these ordered rows at the southwest shore of Lake Washington’s Union Bay. The canal connecting the big lake with Lake Union through the Montlake Isthmus is just out of this scene to the left. 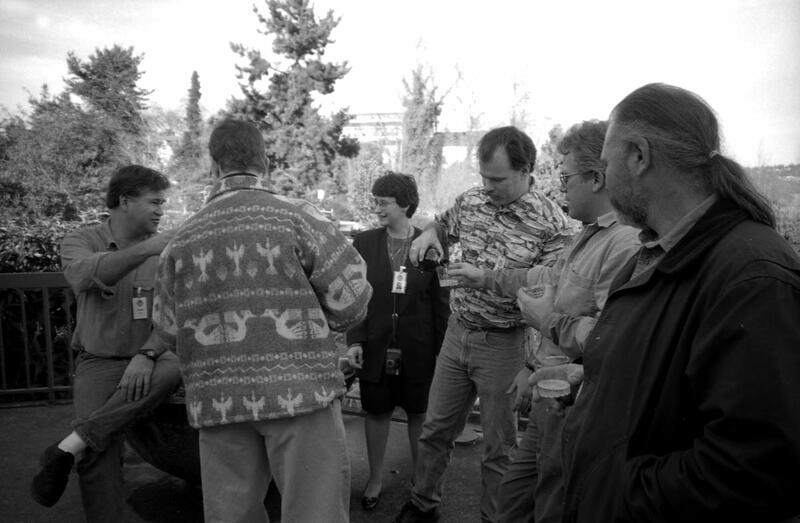 More MOHAI staff celebrating near the museum's front door sometime in the 1990s, I believe. 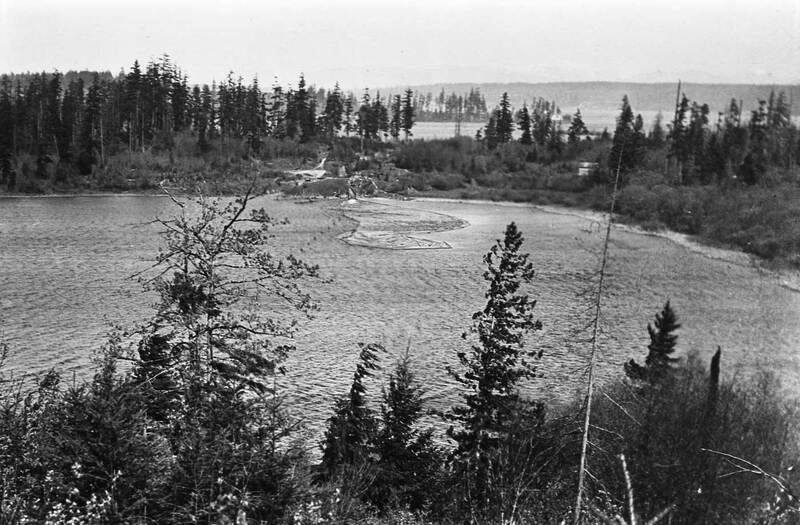 When the cut was completed in 1884, there was still plenty of old-growth forest along Lake Union to feed David Denny’s Western Mill at the lake’s southern end. Nonetheless, the Chinese laborers who did the digging for Denny and others were preparing a way for the much greater virgin reserves beside the larger lake. Like the figures on the scow, the row of driven piles that run offshore, far right, may be hard to see in this printing, but they are the scene’s only fixed artifacts. Looking east toward Laurelhurst or looking west toward Roanoke? As I review past articles I have come across, so far, a few that are mistaken. The size of my errors vary considerably. For instance, this one is off by 180 degrees, better “was” for after first including a facsimile of the Sept 4, 1988 feature directly below (a full confession) we will make the corrections, beginning where “looking east,” as offered in 1988, is now changed to “looking west.” Here goes. Appeared in Pacific Sept 4, 1988. Rick Caldwell, Mohai Librarian then, and Howard Giske, still Mohai's photographer, pose beside the library window. 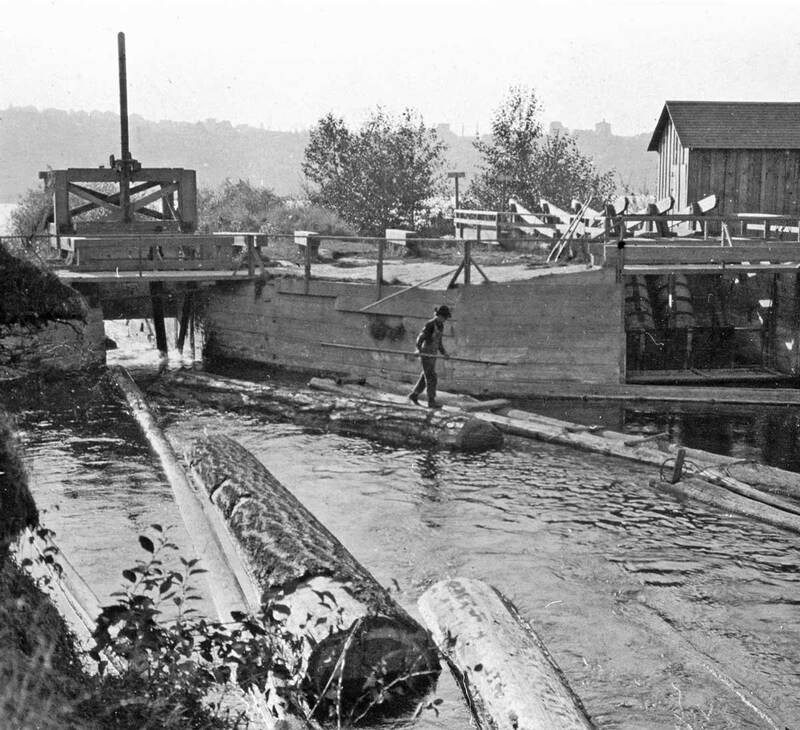 In today’s historical scene, looking west toward the Laurelhurst peninsula, a log is about to pass through the guillotine gate at the Lake Union’s Portage Bay end of the original canal for logs – and sometimes small vessels – through the Montlake isthmus. The first time (about 1975) I pulled this photograph from a stuffed file drawer in the Museum of History and Industry’s cramped library, I first thought it had been taken years earlier from nearly the exact place I was standing, but much later upon years of study and pointed reflection, I realized that I need to get out of library, which is – or now was – near the east Lake Washington end of the canal and proceed to the Department of Fisheries parking lot, which is near the Lake Union or west end of the log canal. As claimed then (in 1988) it was correct to note that the line or route of the old log canal passed just outside the library window. This narrow part of the Montlake Isthmus, was named Uniontown by John Pike, who for painting the then new Territorial University in 1861 was paid with this strategic land, which was also the natives’ regular portage route between the two lakes. Copied from a Lowman Family album with snapshots from the late 1880s thru the 1890s, this is a better record of the east end of the Montlake log canal. That's Laurelhurst - then not yet so named, but more likely called Webster Point - across Union Bay. Billy, I think, is the one on the left. 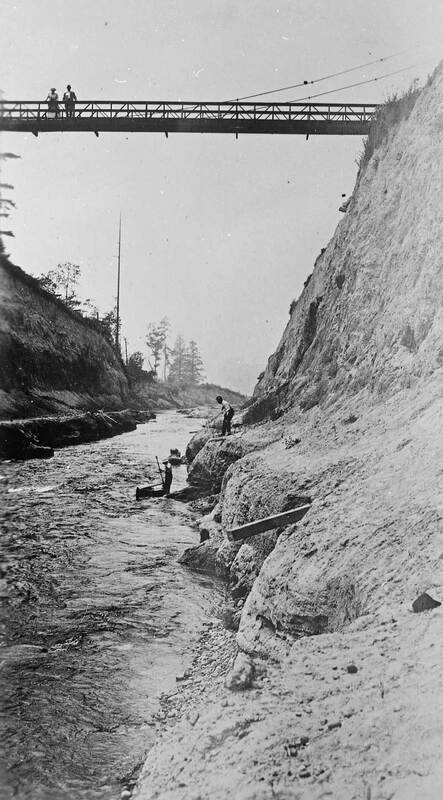 With the 1916 construction of the Montlake Cut portion of the ship canal, the old log canal was filled in and given to other uses including, eventually, most of it became the strip of landscaping along the north margin of State Highway 520’s, approach to the Evergreen Point Bridge. In the “now” repeat from August 1988, MOHAI’s librarian then, Rick Caldwell, stands behind the museum’s photographer, Howard Giske. 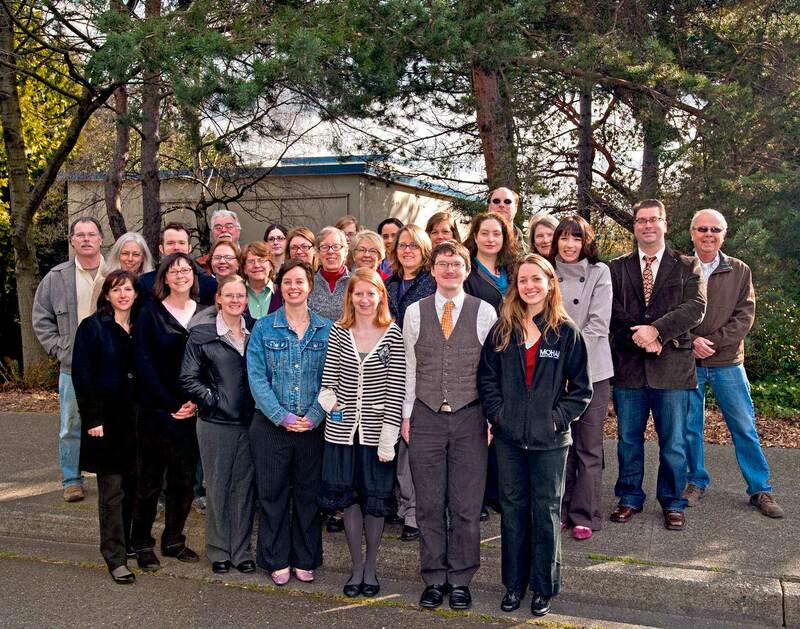 They are posing in the museum’s library, which now in late 2012, is dropped from public use like the rest of the building because of the museum’s move to the south end of Lake Union) Again, while Rick and Howard are positioned close to the log canal they are not so close to the part of it shown above with the locks. 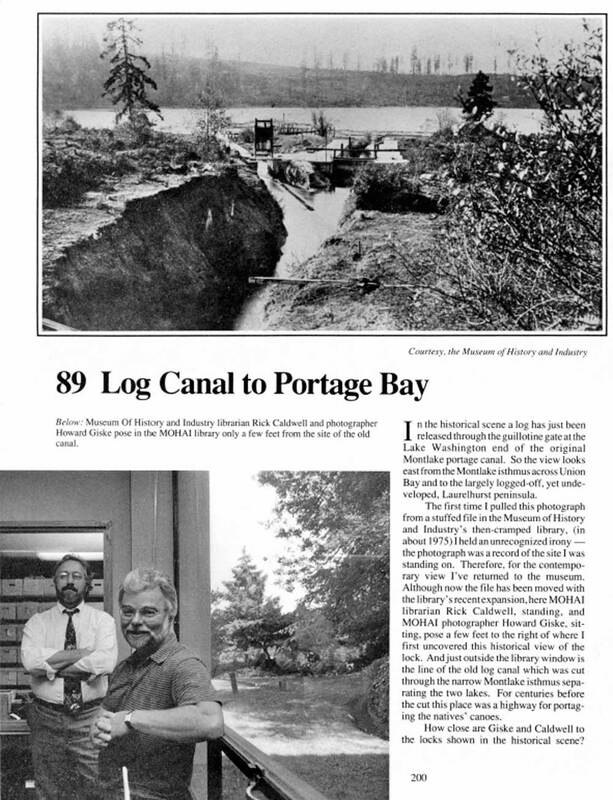 Still remembering – I repeat – that I originally wrote this piece in 1988 when I was under the mistaken impression that they – the mechanical gates of the canal – were at its Union Bay, when in fact they were at the opposite Portage Bay end. Another look across Union Bay from a site "somewhat" close to the one above - perhaps very close for both seem to suggest the architecture of, perhaps, an entrance to the log canal at this the east end. The town of Yesler - with Henry Yesler's last mill - can be glimpsed on the far shore. The mill site is now taken by the U.W. 's school of horticulture. Yesler was able to open a mill here after the Seattle Lake Shore and Eastern Railroad reach the site with a spur in 1887-88. Henry's last mill on his wharf at the foot of Mill Street (Yesler Way) burned down, also in 1887. He did not rebuilt it there. The railroad surely took some of the activity - moving lumber - from the log canal. Had I caught the mistake before the presses rolled, I might have moved Rick and Howard out of the library and walked with them over to that parking lot and shot to the west. But then their relevance would have somewhat dissipated, except to strengthen a confession of my mistaken first impression. But why would I wish to make a point of that if I corrected it in time – I ask? 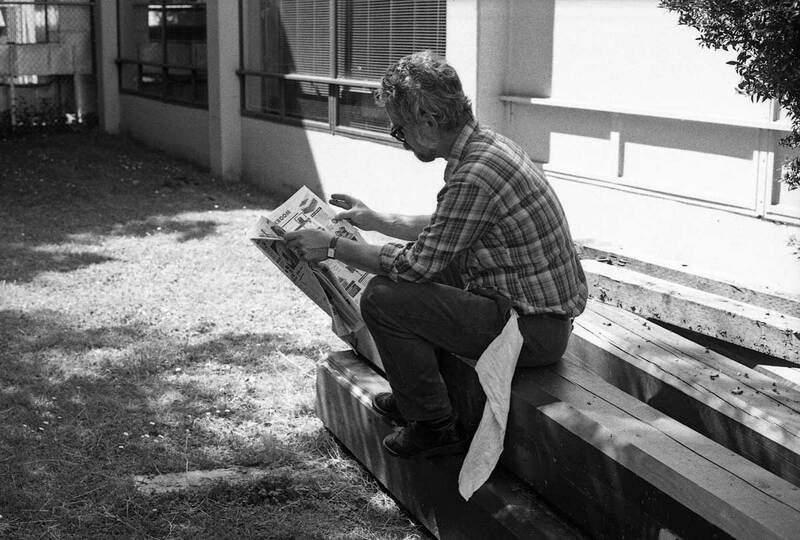 Howard Giske relaxing with a trade tabloid near but now outside the windows to what was, until recently, the MOHAI library. I don't remember when I took this but it was probably at least twenty years past. Surely I would still have liked to somehow feature these fellows – as fine representatives of the museum and stewards of local history. 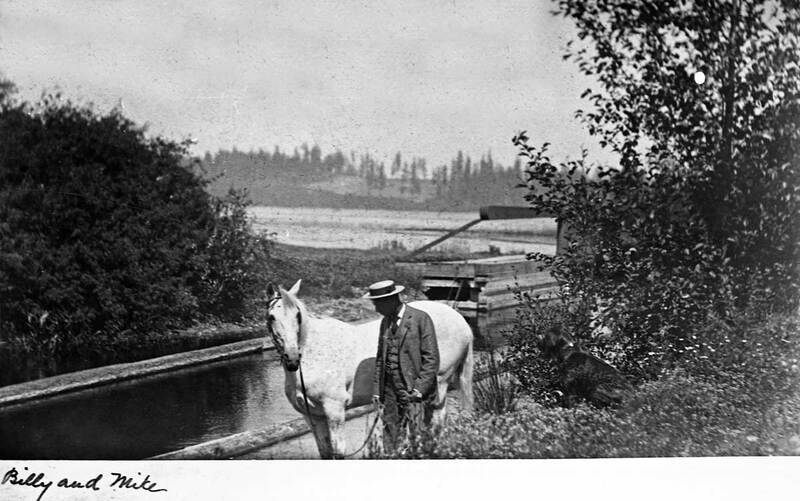 So I might have chosen a different photograph of the canal from the MOHAI collection, one at its east or Union Bay end. (Like those printed above or the stereo that follows with the next feature.) That alternative would have been relevant at least to Rick’s status then as the MOHAI librarian, and I might have asked Howard, the photographer, to take the new shoot of the chute and those locks. A copy of an original stereo and intimate record of those locks is in the MOHAI collection. The original – the stereo printed below with the next feature – was recorded by Frank Harwood about 1907. 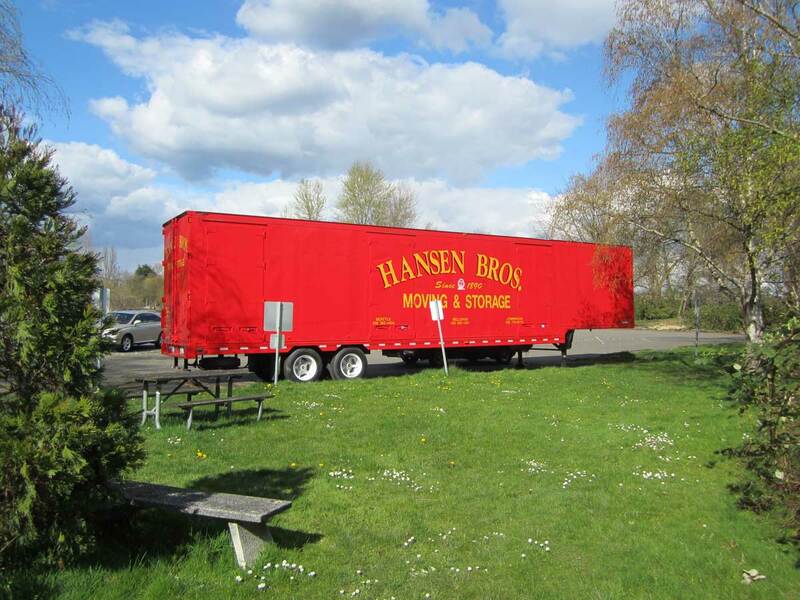 The Hansen movers van for staging MOHAI's big move from Montlake to the south end of Lake Union. I took this last Spring (2012). It looks north towards Union Bay and the prospect is close to that used by the photographer of the second subject above this one, the one that shows the town of Yesler on the far shore. 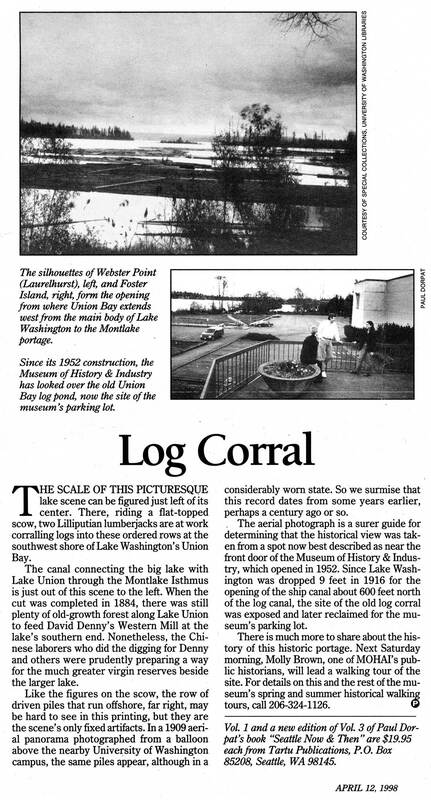 This is the most intimate record of the locks on the old Montlake Log Canal that has ever been shared with me. It is one part of a stereo recorded by Frank Harwood around 1907. 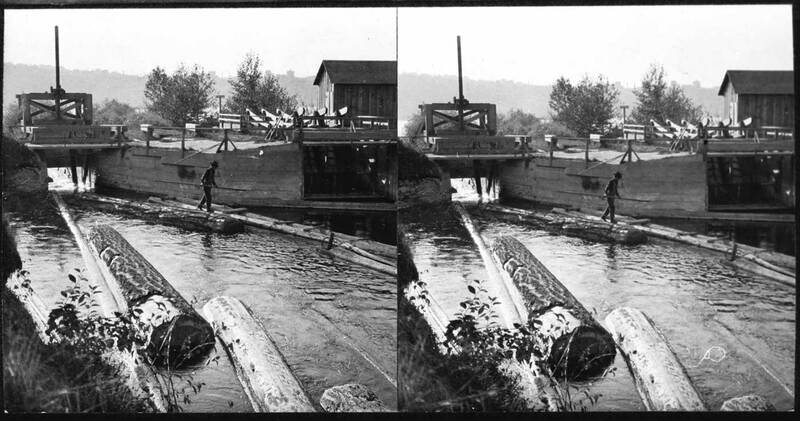 When properly spied through stereoscope optics, the floating logs in the foreground of the original actually seem to be wonderfully in the foreground. With this third dimension, the logger near the locks’ guillotine gate needs considerably more skill to ride his log. 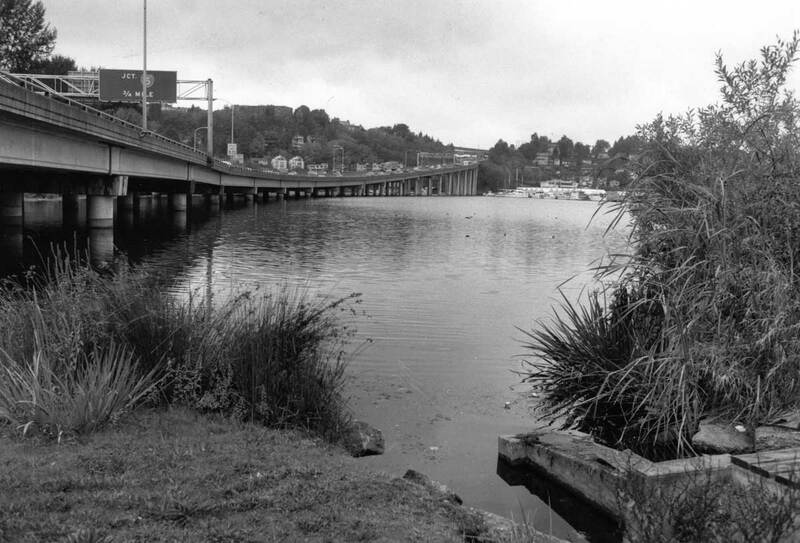 Like the Indians before him, Harvey Pike first saw the importance of this isthmus as a low and short portage between Lake Union’s Portage Bay and Union Bay on Lake Washington. 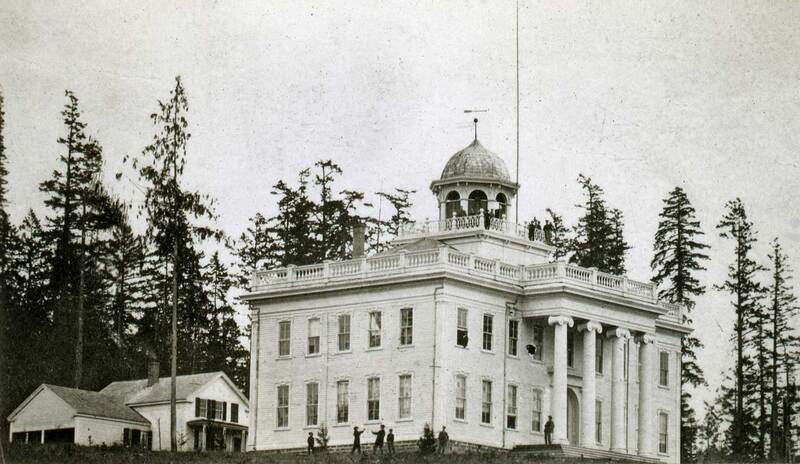 He was paid with this land for painting the original University of Washington building in 1861. Pike platted and named his prize Union City, and soon he also began excavating a ditch for moving logs. The big lake was then ordinarily around 9 feet higher than the small. (The opening of the ship canal in 1916 dropped the big lake to the altitude of the small one.) Predictably, Pike soon gave up this digging. Still, he kept an eye open for opportunities, and in 1871 transferred his deed to Californians with deeper pockets. They first laid a narrow-gauge railroad across the isthmus. Between 1872 and ’78, these rails carried cars filled with the black gold of Newcastle. In those years coal, not lumber, was Seattle’s principal export. Looking west over Portage Bay to Roanoke and in line with the Highway 520. This prospect is somewhat close to the site of the log canal locks and chute. 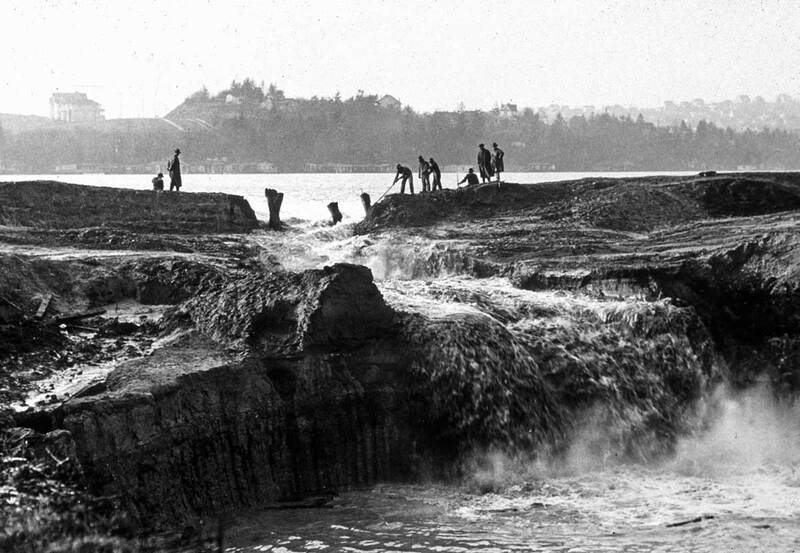 Abandoned by the eastside miners for a more direct route around the south end of Lake Washington to the Seattle waterfront, the Montlake Isthmus was at last scored with a deep ditch for logs in 1883 by Chinese laborers. This guillotine lock was built near the Portage Bay end of the cut, within a frog jump of the University of Washington’s row of odd-shaped fish hatcheries set today beside Highway 520 and so also its parking lot. 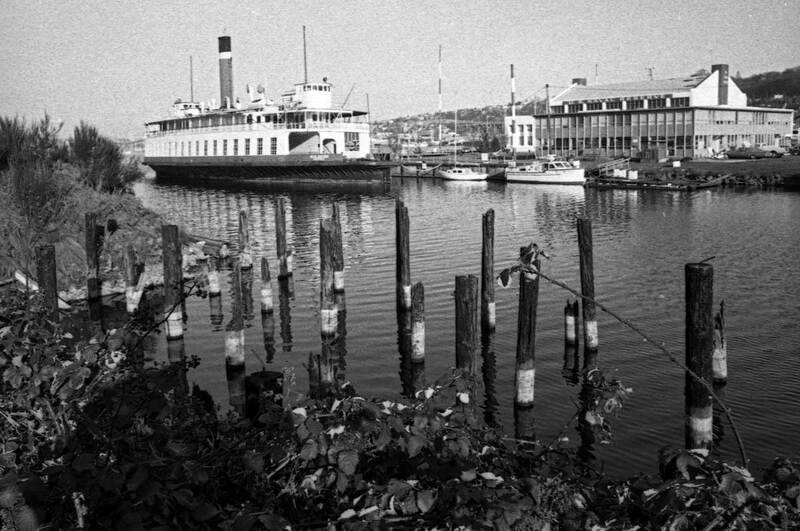 The San Mateo still moored in the slip between Westlake Ave. and the Naval Armory. I snapped this sometime in the 1980s - I suspect. This I recorded while helping Walt Crowley illustrated his National Trust Guide to Seattle landmarks in the mid-1990s. It was about then that the hardly used armory was beginning to be studied for new uses, and some of them concentrated on maritime heritage. MOHAI photographer Howard Giske took the now photograph from a slightly different angle than the historical scene in order to escape the landscape that now borders the western end of the Highway 520 Evergreen Point Bridge. The Boeing B-1 still hangs from the ceiling although you cannot see it because the windows were covered in one of the changes the came with the building of the bridge. Historical photo of museum is by Art Forde and Fred Carter Photographers and courtesy of MOHAI. Jean's repeat recorded for the MOHAI exhibit Repeat Photography, which we curated with Berangere Lomont, also of this blog. 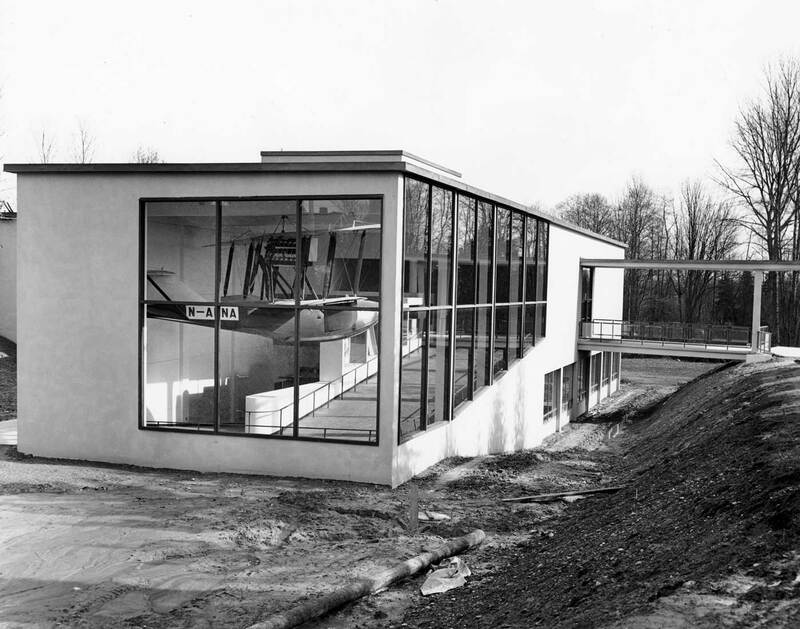 When “little Victoria Watt” the great-great granddaughter of “city father” Arthur A. Denny cut the dedicatory ribbon on Feb. 15, 1952 the “Spirit of Seattle Memorial Building” looked much as it does in this older scene with a Boeing B-1 that seems to be flying through the windows. Actually (and appropriately) the B-1 is hanging from the ceiling of the museum’s southwest wing named for the Boeing executive Phillip Johnson. And the building is better known as the Museum of History and Industry, or MOHAI for short. 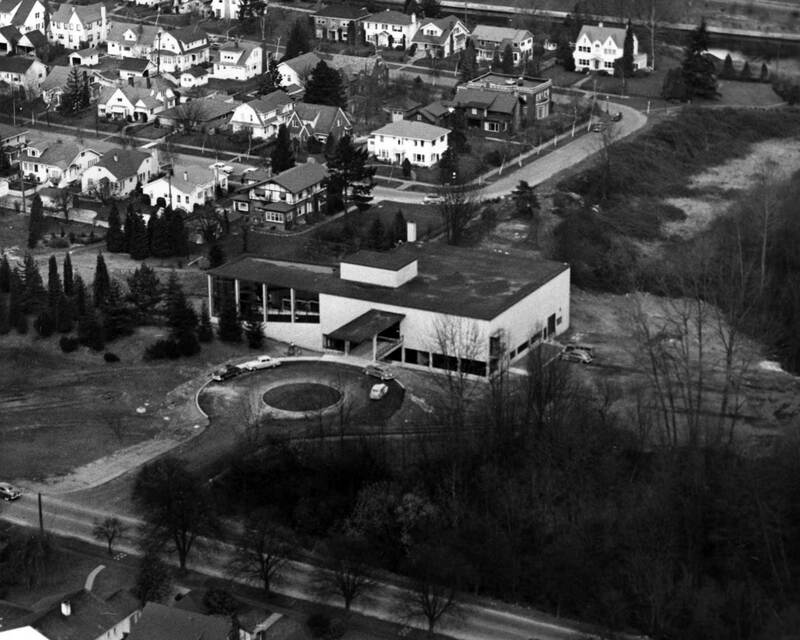 An aerial of the nearly new MOHAI at its MONTLAKE address before the intrusion of the freeway connection to the Evergreen Point Bridge and also before the museum's several additions. Here the original entrance on the south wall with a ramp to the front door is still intact. 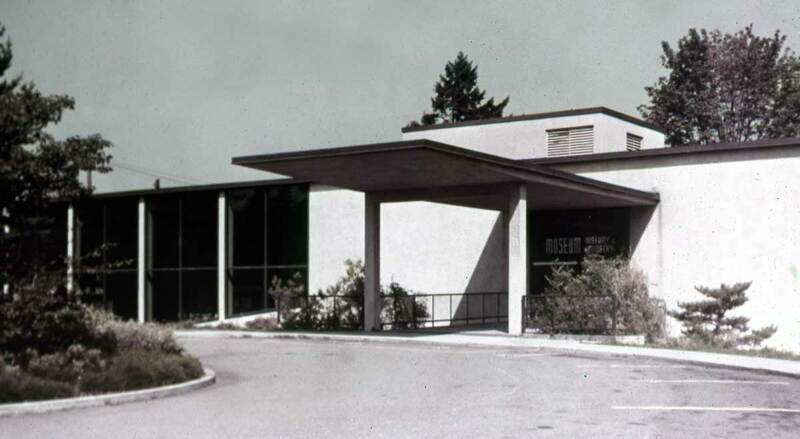 The more historical photograph was probably recorded some time before Victoria did her snipping for the long ramp including the high wall behind the plane are peculiarly free of any of the many artifacts that the Seattle/King County Historical Society had been collecting for just such a home since it was first organized in 1911. When it opened in 1952 the entrance was reached over the bridge shown on the right. Neither Paul Thiry, the architect, nor Guen Plestcheef the Society’s activist president (and also daughter of Emily Carkeek, the Society’s founder) would have known in ‘52 that in another eleven years the approach to the museum’s front door would be crossed by the west bound off-ramp of the Evergreen Point Bridge as it cut through the Montlake neighborhood. The main entrance, of course, was moved to the north side of the building and soon MOHAI also had a wings added for an auditorium and more (but still not enough) storage for its growing collection. Looking east on the log canal to Union Bay. The photo was probably taken from a crude bridge that spanned the canal, which was some distance to the west of MOHAI's future footprint. 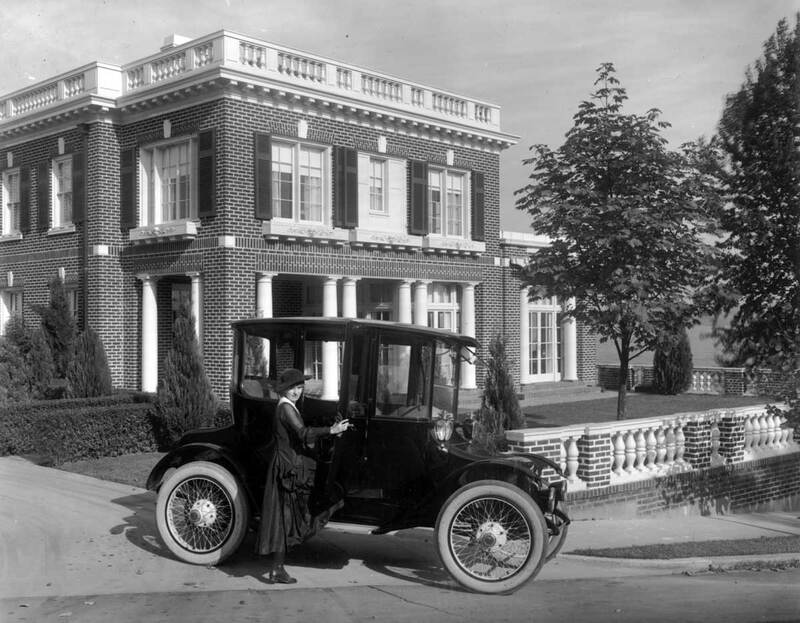 Originally the driveway to the Redelsheimer home came directly from E. Denny Blaine Place, the better to use the mansion as a backdrop for posing new cars like this electric one. [Photo courtesy, Webster Stevens Collection, negative number, 83.10.10,652.1.] The ornamental fence between the mansion and the public sidewalk survives but the direct driveway to the big home has long since been replaced with a screen of trees. 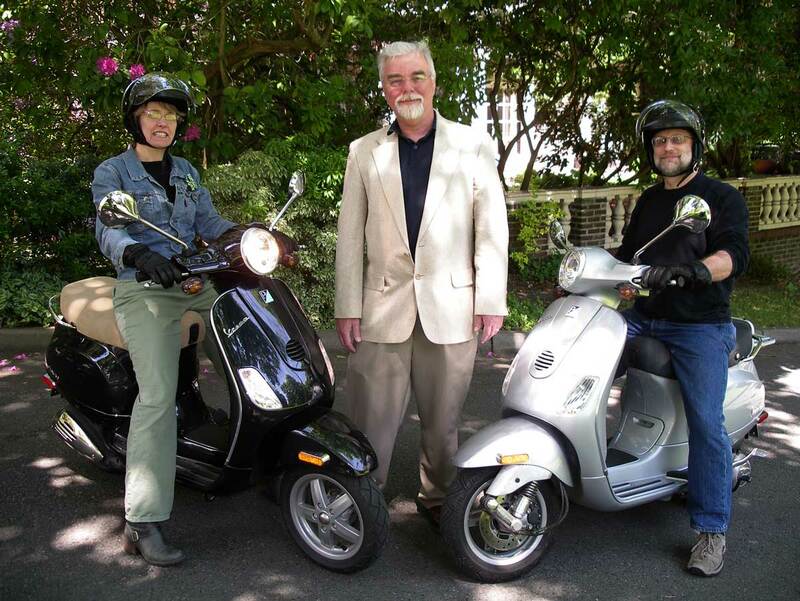 In the “now” photograph Howard Giske, the Museum of History and Industry’s Curator of Photography, poses “in the balance” between two Vespas driven to the historical site by Nicky Ducommun and Brad Stone, left and right, respectively. Putting Giske in the “now” was my idea. Adding the fuel-efficient scooters was his. Both views were posed on the public parkway in front of the lavish Lake Washington waterfront home Seattle clothing scion Jules Redelsheimer built for his family in 1910. (It is directly across E. Denny Blaine Place from Denny Blaine Park.) Eight years later in 1918 The Seattle Times editorial photographers, the Webster Stevens firm, posed an electric car in the Redelsheimer’s original elegant driveway. Now it is a reminder that the current interest in battery-driven cars is a long-awaited revival. Curator Giske included this photograph among the 100 subjects – photographs, paintings, maps, lithos, postcards – in his standing exhibit because it fits his theme, “Nature In the Balance.” His is a show of Northwest classics, although many of them may be new to those who have the wisdom to visit the museum before this exhibit closes on the ninth of September – not so long from now. Among the paintings featured are works by Kenneth Callahan, Richard Bennett, Emily Inez Denny, and Guy Anderson. To quote MOHAI literature, the exhibit is about “the complex relationship between people and nature in Washington State during the past 150 years.” Among the photographers adding variations on this “Howard’s Theme” are historical ones, like Asahel Curtis, and Anders Wilse, and contemporary ones, like Fred Milkie Jr. and Josef Scaylea. 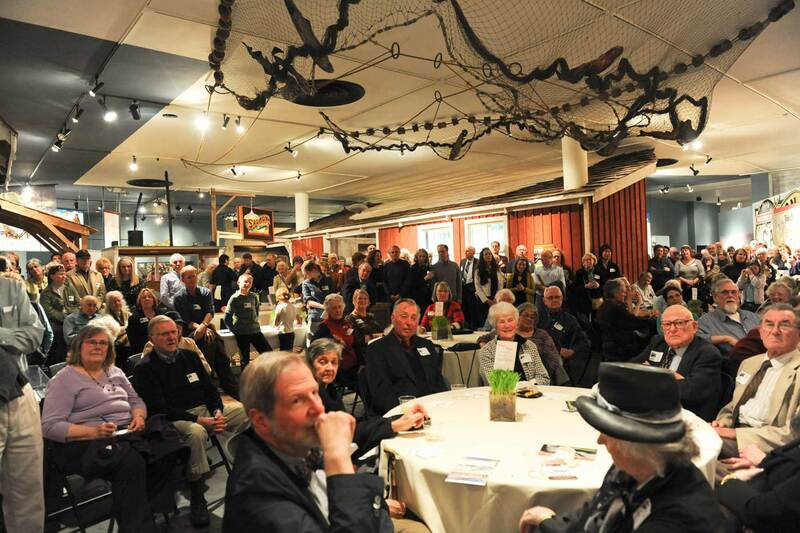 Having no record of Howard's Nature in Balance we substitute this snapshot I took from the speaker's podium during Jean, Berangere, and my MOHAI opening last April 2011 of the exhibit Repeat Photography. 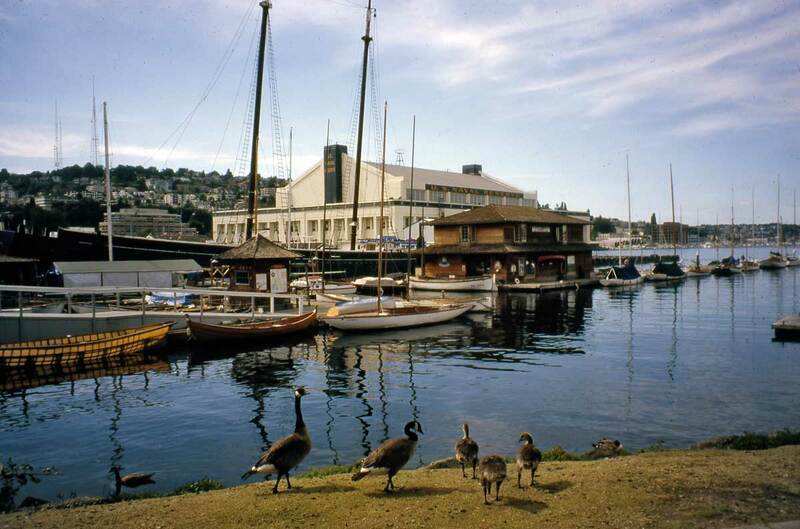 Perhaps, no strip of regional real estate has engineered more dreams of empire than the isthmus that used to separate Lake Union from Lake Washington. 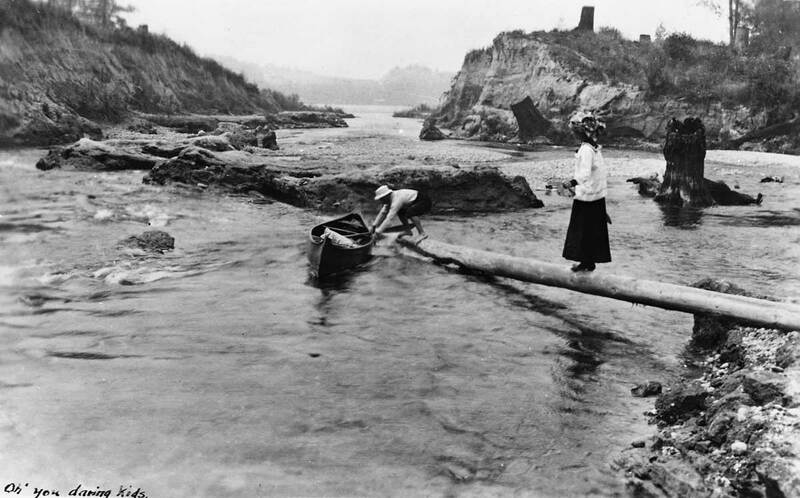 From the beginning of white settlement it inspired local boosters to imagine the cornucopia of raw materials that would come spilling out of Lake Washington right to the back door of Seattle, once the cut could be made through that little ribbon of land. The line of the first cut can be faintly seen in in our two turn-of-the-century panoramas. The first one dates from about 1899 and the one following it from about 1903, and there has been some clearing and development between them. These were boom years all around. Both views was recorded from near where the photographs were taken for the linked story about the freeway in 1964 when it was nearly new. The first cut diagonally passes through the isthmus at the center of the photograph. The Lake Washington side ingress is just right of the four small and two tall trees. Built in 1883 by Chinese labor under the pay of local promoters David Denny, Thomas Burke and others, it was designed for scooting logs from the big lake into the millpond on Portage Bay, and eventually on to the mills of Lake Union, David Denny’s Western Mill at the south end of the lake included. 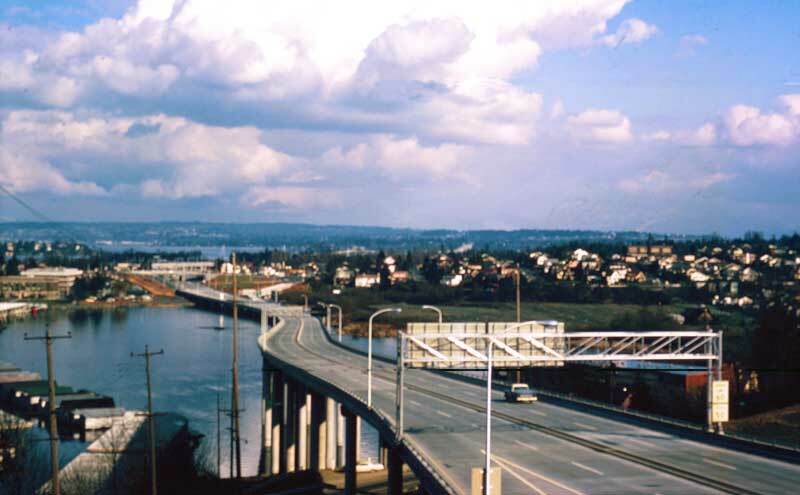 The nearly new and largely vacant Evergreen Point Bridge connector on the afternoon of Feb. 24, 1964. Compare this to Jean's recent look east also from the Roanoke overpass. Jean moved father south on the bridge in order to avoid the the landscaping on the north margin of the freeway. Our two views continue east across that dividing land, part of today’s Montlake neighborhood, to Lake Washington’s Union Bay, which was then considerably larger than today and would stay so until the big lake was dropped 9 feet in 1916. Just beyond rises the Laurelhurst peninsula (largely cleared in the ca. 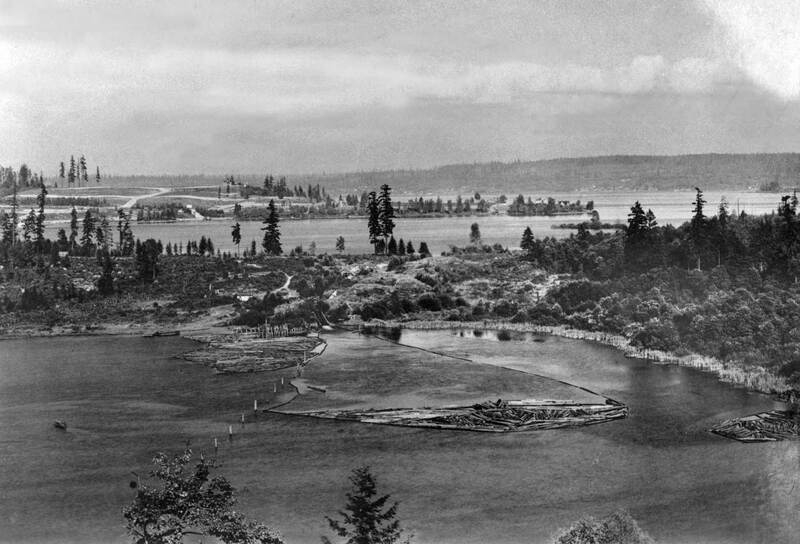 1903 photo), and in the distance, Kirkland can be seen across the lake. Although this setting has its pastoral touches, the signs of development in the two turn-of-the-century panoramas above are almost everywhere. Not seen, but to the left of the photographs, is the town of Yesler. There, in the late 1880s, near the present site of the University’s horticulture center, pioneer Henry Yesler put up a namesake mill. Most of Laurelhurst was possibly first clear-cut by Yesler’s saws, then milled and finally shipped to market on the Seattle Lake Shore and Eastern Railroad. (That railroad’s bed was later transformed into the Burke Gilman Recreational Path.) By 1887/88, Thomas Burke’s railroad had reached both Ravenna and Yesler at the north end of Union Bay. The lakes were first joined by name only on July 4, 1854. Most of Seattle gathered then to celebrate Independence Day on Thomas Mercer’s claim near the southern end of a lake the Indians called “little water.” Mercer proposed that the “big water” to the east be named “Washington,” and that the little water on whose refreshing shores they were gathered be called “union.” Someday, Mercer proclaimed, it would surely be the connection for an even greater union between that big lake and Puget Sound. The locals agreed, and from that moment on there was a recurrent agitation to consummate that union. The first person to actually try it was Harvey Pike. He followed his father John Henry Pike to town in 1861. The elder Pike was employed to help design and build the then new Territorial University at the northeast corner of Fourth Avenue and Seneca Street. His son was given the job of painting the new school and his wage was a deed to part of this isthmus in present-day Montlake. The territorial university at the northeast corner of Seneca Street and Fourth Avenue. Harvey Pike actually tried to split his land in two with a simple pick, shovel and wheelbarrow. This, in the way of tools, was only a little more than Moses used to divide the Red Sea. But Harvey Pike had none of the divine aid, or in his case, federal subsidy, and so he had to give it up. The subsidy wouldn’t come in large amounts until 1910 when a Rivers and Harbors Act passed by Congress included $2,750,000 for the construction of locks down at Shilshole, so long as King County agree to finance and build the canal that would run from the locks to the “big lake,” and the county agreed consented. 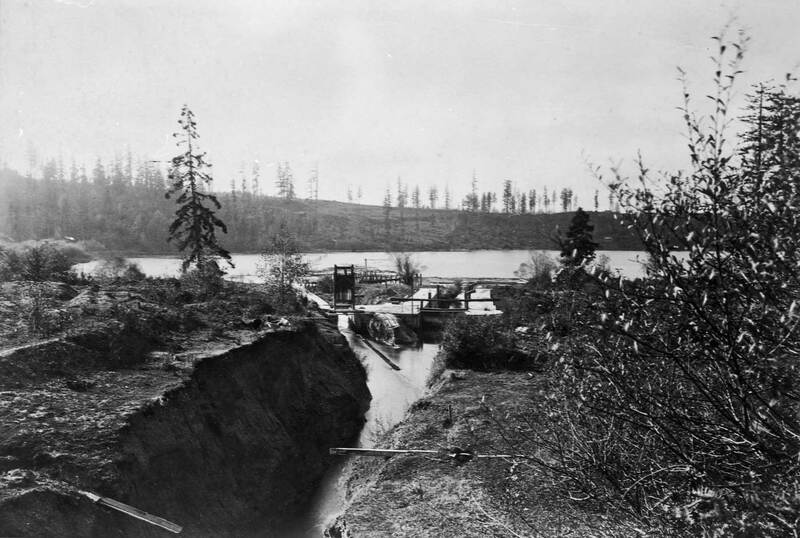 The last development of the Montlake log canal before it was abandoned in 1916 for the ship canal about 600 feet to the north, was – it seems – its widening and the relocation of the locks from the west end of the canal to the east end at Union Bay. The above photo was taken in 1911 as were the first three below. The subject was the romantic adventure of taking a canoe through the cut. It was obviously a struggle. This - it seems - look east from near the Portage Bay end of the canal, which is now cleared of its locks and chute. The high suspension bridge was also a late and short-lived addition. This snap from the same semi-romantic adventure looks west into Portage Bay. 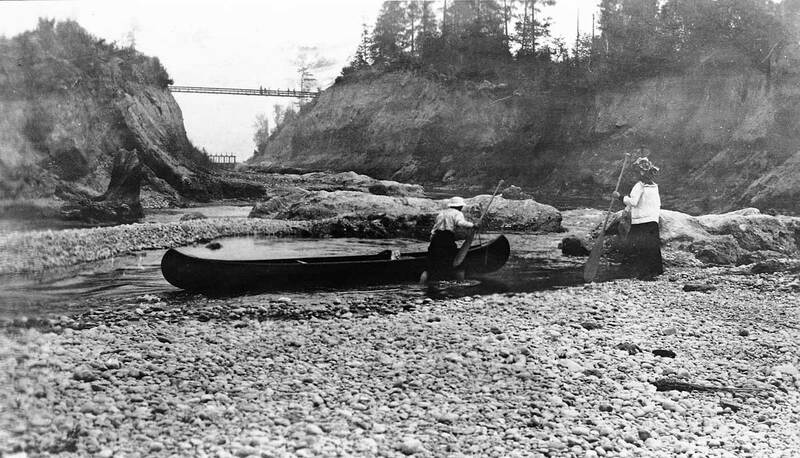 When the channel between the two lakes was opened in 1916 the greatest change was not the opening of the hinterland to the opportunity and exploitation of military and industrial steamers, but rather the lowering of the big lake and thereby exposing thousands of acres of fresh bottom-land. 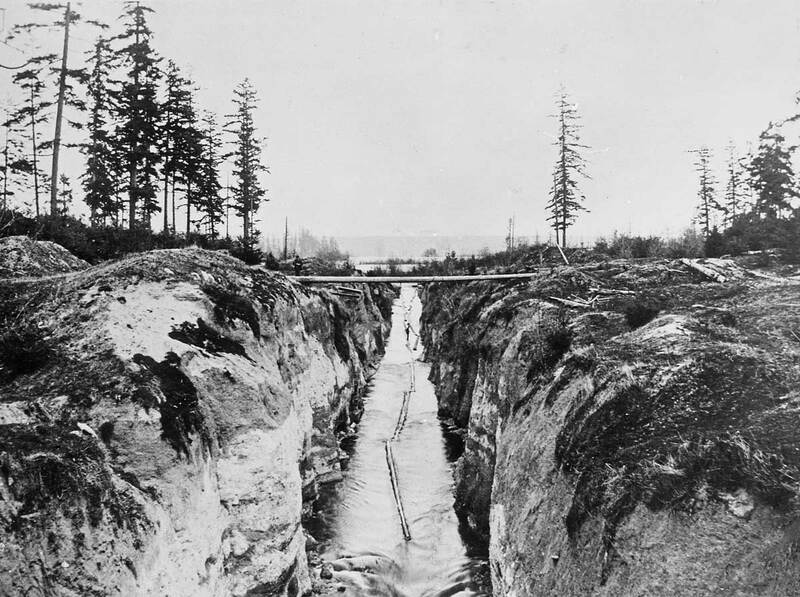 When the contemporary canal from salt water to fresh was completed in 1917 its Montlake Cut was a few hundred feet north of Harvey Pike’s strip of opportunity. And its primary traffic was, and still is, not ocean-going steamers but pleasure craft. 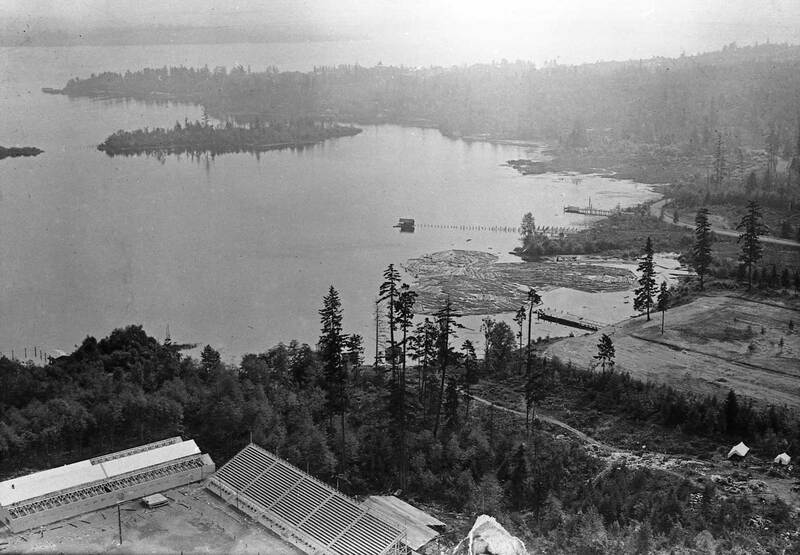 At two in the afternoon of August 25, 1916 the cofferdam, which separated the dry ditch of the then recently rendered Montlake cut, was broken and the waters of Portage Bay were released to hasten the work of both eroding the dam and filling the cut. Dredging followed here at the west end of the cut and then at the east end Lake Washington was slowly through a dam about 9 feet to the level of Lake Union. The lowering of the big lake through the temporary dam continued from Aug. 28 into October. The dam was then removed. The work was "polished" with some more dredging, this time at the east end. An Opening Day on Union Bay. Photo by Robert Bradley courtesy of Lawton Gowey. A mere half-century old – in 2000 – this exquisite view of University of Washington crews flying past photographer Josef Scaylea required patience on the part of the “Toscanini of the Camera,” as former Seattle Symphony Director Milton Katims called him. But what a shot! “Luck is big factor,” Scaylea recalled. “The shells came through all bunched up. 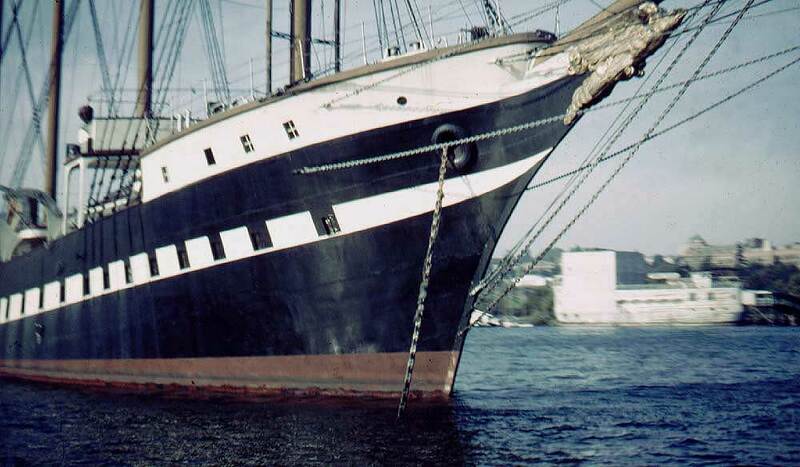 I would have settled for one or two but here was the whole fleet.” Like many locals, Scaylea was in love with the Fantome, the four-masted schooner yacht that for nearly 14 years was anchored in Lake Union’s Portage Bay. The shot he first imagined and eventually got put the Fantome and University of Washington crews together. 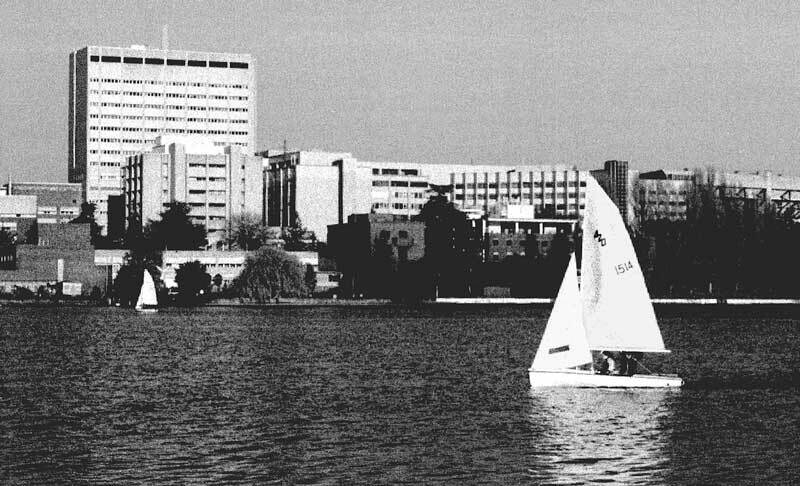 The scene also includes a portion of what in 1950 was the nearly new University of Washington Medical School across the bay. 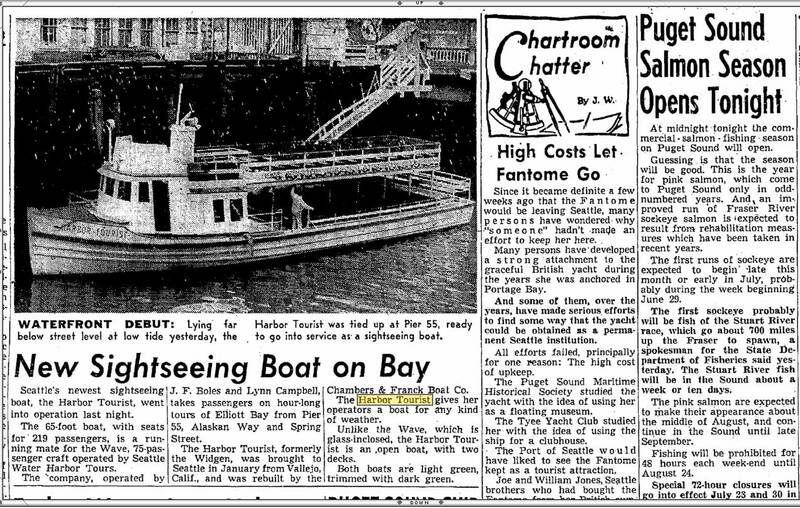 Fantome on Portage Bay in 1946. The landlocked Showboat Theatre is seen, far right, set on the University's waterfront near the foot of 15th Avenue. Owned by AA. Guiness, the British malt-liquor manufacturer, the Fantome arrived in Puget Sound in 1939. 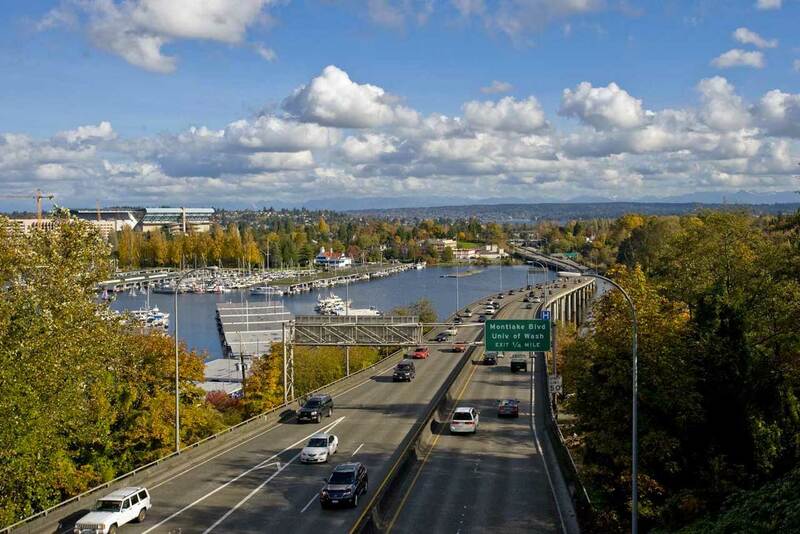 It was laid up in Portage Bay first during World War II and then, until 1952, in litigation with King County after Guinness refused to pay personal property taxes on it. Eventually, Aristotle Onassis purchased it as a wedding gift for Grace Kelly and Prince Rainier of Monaco. When the Greek shipper was not invited to the wedding, he kept the ship and it ultimately wound up running luxury cruises in the Caribbean. 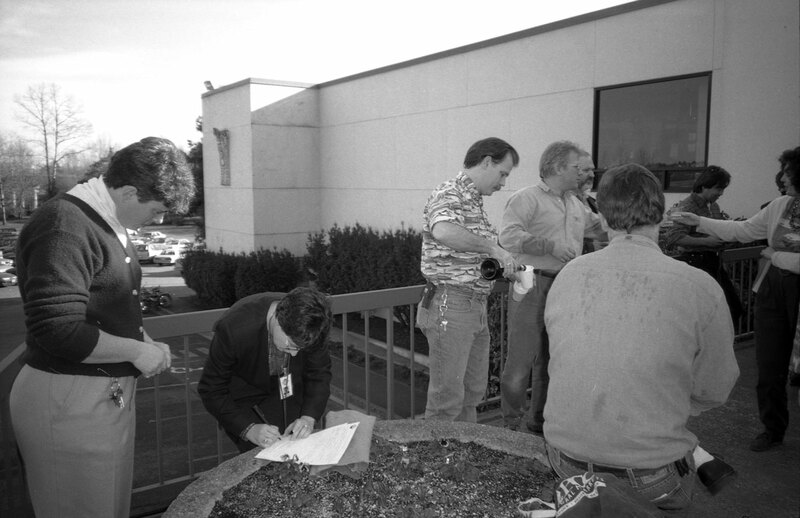 It and its crew were lost last year (1998) to Hurricane Mitch. 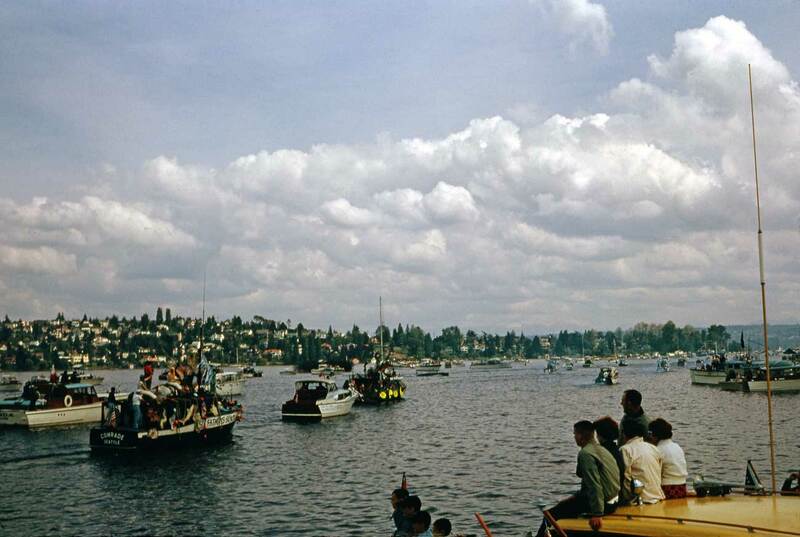 A 1949 regatta on Portage Bay with the Fantome right-of-center. Photo by Lawton Gowey, Robert Bradley or Horace Sykes. This and many other Scaylea photographs appear in a new book of memories by Stanley Richard Pocock, a local figure revered for his years of teaching rowing. Pocock’s “Way Enough! Recollections of a Life in Rowing” is a big book – almost as big as the shells he and his father, George Pocock, lovingly constructed in the old University of Washington shell house and later in their Lake Union shop. 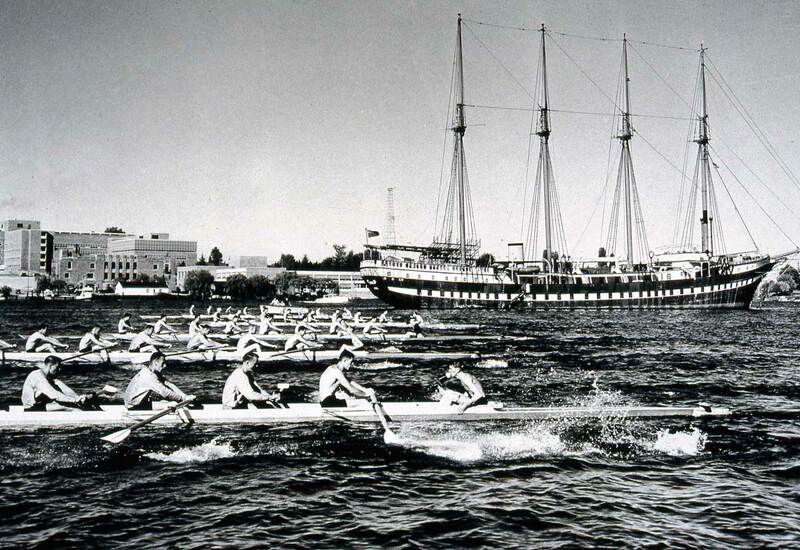 The famous Pocock shells were sold worldwide and both they and their crews won many gold medals. Part of the news regarding the loss - to Seattle - the Fantome in 1953. The clip appeared in The Seattle Times on June 14, 1953.